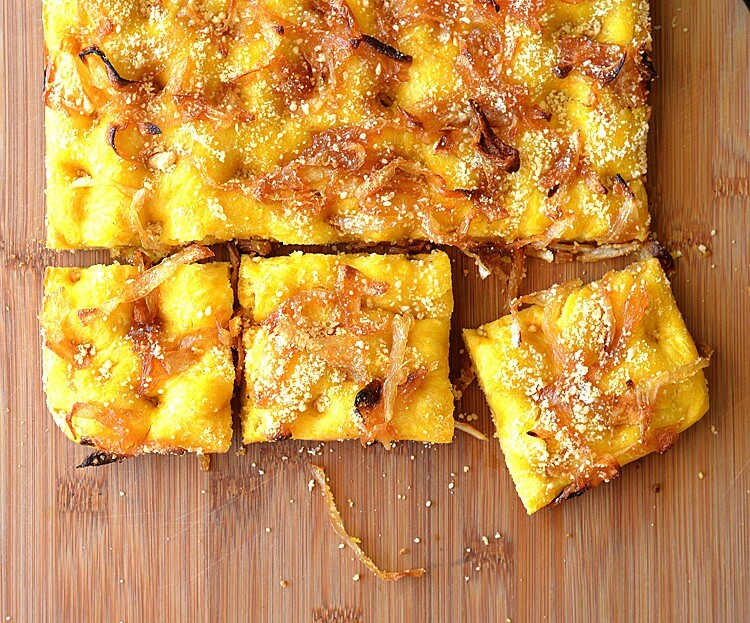 This Butternut Squash Focaccia with Caramelized Onions just makes me happy. So many of my favorites in one bread! 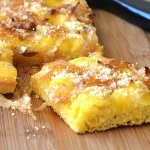 There are recipes out there for focaccia topped with squash, but I found few that used it, or sweet potato, as the base for the dough itself. This one is a compilation of many after hours of research on how to adjust the moisture content. It turned out perfectly and tastes absolutely delicious! I just love the golden color of the bread which is further enhanced by the deep, rich color of the slow cooked apple cider onions. You can enjoy it on its own, use it as bread for a sandwich or panini and even cut it into bite-sized appetizers and top it with a cranberry jam. What makes this dough different from those I have posted previously here and here, is that the first rise is done slowly…in the refrigerator. Overnight. This is typical of many focaccia recipes, but my first attempt at such a dough. The following morning, you remove the dough and form into your pan. Cover with kitchen towels in a warm place and let rise until double in size. This is when I caramelize the onions with apple cider, apple cider vinegar, salt and sugar along with a little oil and vegan margarine. In the risen dough, be sure to make these little dimples or impressions to give your onions somewhere to go. The baking process continues cooking the juicy onions and to avoid them drying out, I added 1 tsp of vegan margarine to the caramelized onions so there was some additional moisture. The only cheese is the parmesan, so unlike pizza with a melting cheese, this one contains less moisture. Preheat the oven to 400 degrees, sprinkle with sea salt and top with the onion mixture (and a sprinkle of GO Veggie! Parmesan Topping if you so desire (I did :). Bake for about 20-25 minutes, checking for doneness. Allow to cool on a rack for a few minutes prior to cutting and serving. In the bowl of an electric mixer fitted with a dough hook, add the yeast, flour, squash, oil and salt. Warm the almond milk slightly (be sure it is neither cold, nor too warm or the yeast will not activate). Add about 3/4 of the milk to the flour mixture, holding some back. You may not need it all. While the dough is kneading, you can determine if more flour (or more milk) is necessary. I added about another 1/4 C of flour and did not need all of the milk). This is a sticky dough, so once the dough forms a smooth ball, you are done. It will still be sticky. Place into a lightly oiled bowl, coating all sides, and cover with plastic wrap. This dough requires two rises. The first rise is traditionally a slow one, done in the refrigerator overnight. 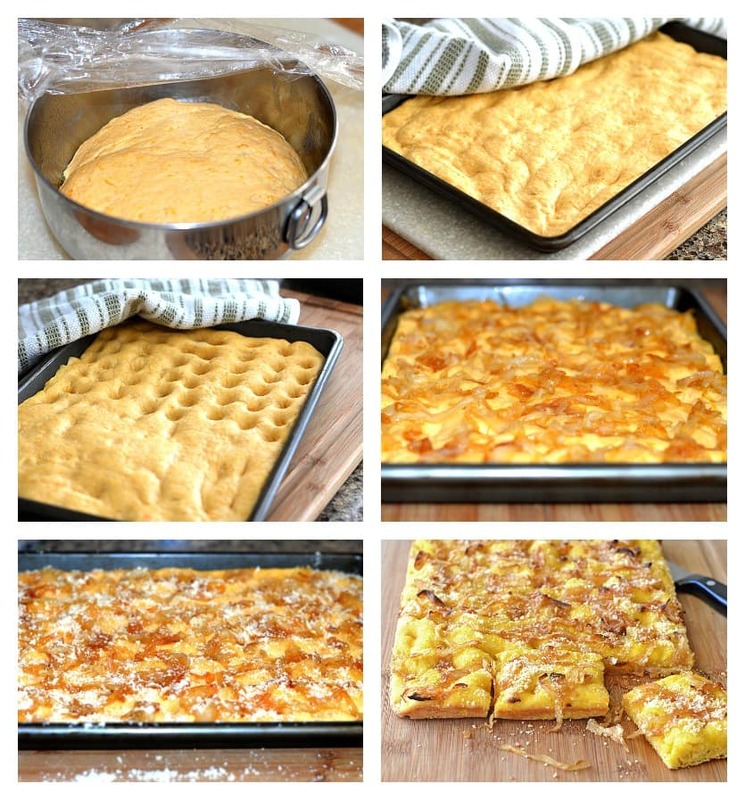 The following morning, press the dough into your sheet pan and cover with a clean, lint-free kitchen towel. In a warm place, allow to come to room temperature and ultimately, it's second rise. The dough should be double in size before proceeding. Meanwhile, in a saute pan, add the oil and vegan margarine. Add the sliced onions, apple cider, sugar and vinegar and saute on medium-high heat until the liquid mostly evaporates, then on medium-low until very golden and caramelized. Add 1 tsp of vegan margarine and allow to melt. This will help keep them from drying out when baking. 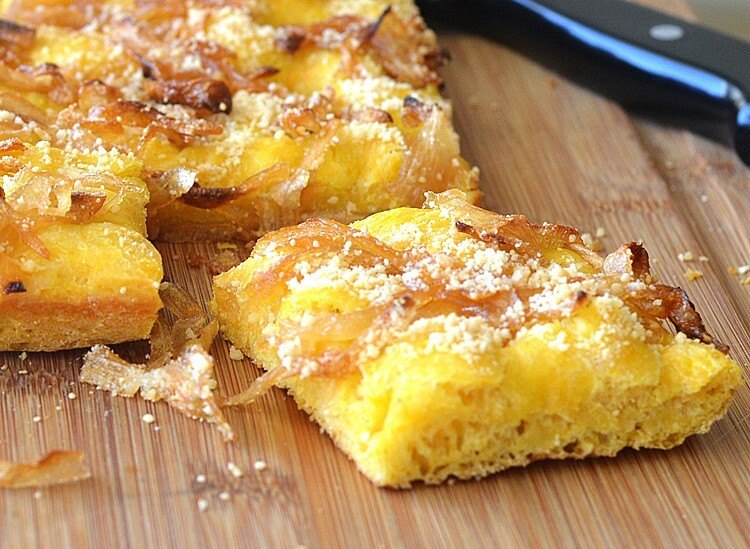 To the risen dough, sprinkle with sea salt and top with the caramelized onions. I also like to give a sprinkle of GO Veggie! 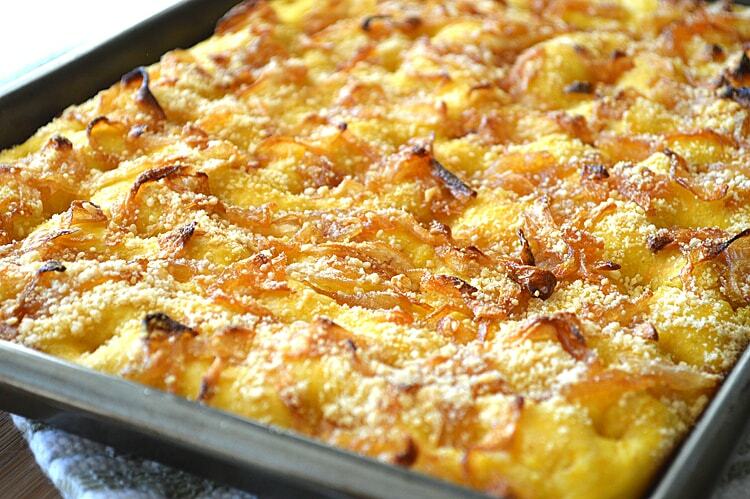 Parmesan Topping. Bake at 400 degrees for 20-25 minutes. It may take more of less, so keep an eye on things. Transfer the focaccia to a rack to cool. This focaccia is perfect for enjoying 'as is' or for a sandwich. You can also create appetizer-sized bites and serve with a cranberry jam.